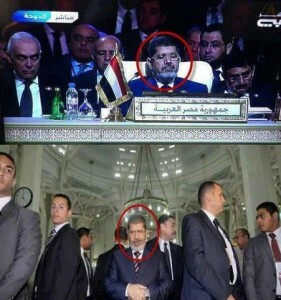 As we all know, Egypt’s President Mohamed Morsi has a real skill for classical statements. So, I will gather the more famous ones on this page so we can all admire his infinite wisdom. 26th of March 2013: “I will not allow anyone to put their fingers in Egypt,” Morsy said again at the Arab League Summit in Doha today. The below picture is from the same summit. The latest one goes something like “There are two or three fingers playing in Egypt!” – said during a women’s conference here in Cairo. I think he might have meant by this that he holds his finger on Egypt, but what he actually said makes it so much more classic! When he was in Germany on official visit meeting with Angela Merkel, he made clear that “gas and alcohol don’t mix!”. Who knows what he meant by that.. Other than making this classy statement worthy a real politician and loved President, I believe he went home empty handed so to speak. Use the comment field below to share your favorite quote by President Morsi, and I will include them in this collection of classical quotes and sayings by the President!